Wikipedia tells that RMS Lusitania was a British ocean liner, named after the ancient Roman province of Lusitania, which is part of present day Portugal. The ship entered passenger service with the Cunard Line on 26 August 1907 and continued on the line's heavily traveled passenger service between Liverpool, England and New York City, which included a port of call at Queenstown, (now Cobh) Ireland on westbound crossings and Fishguard, Wales on eastbound crossings. Lusitania was constructed as part of the competition between the Cunard Line and other shipping lines, principally from Germany, for the transatlantic passenger trade. Whichever company had the fastest and most luxurious ships had a commercial advantage: Lusitania and her sister Mauretania together provided a regular express service between Britain and the United States until the intervention of the First World War. 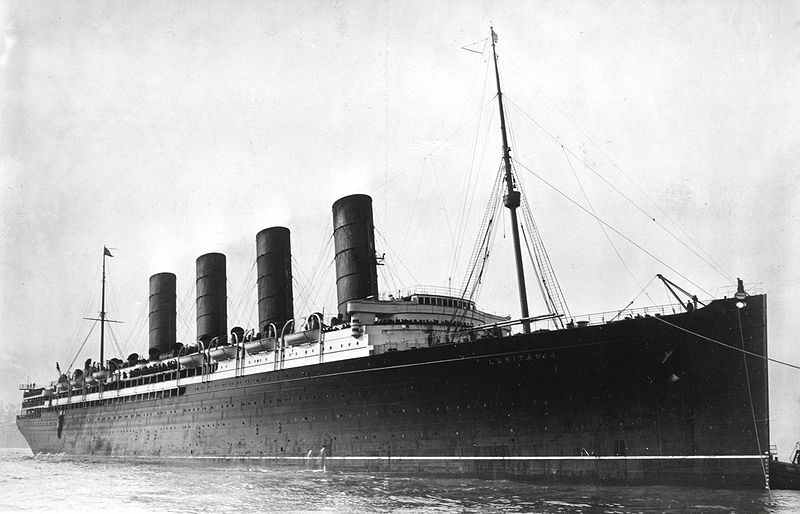 Lusitania was briefly the largest ship ever built at the time of her completion (due to the slightly larger Mauretania, entering service shortly after.). She was 70 feet (21 m) longer, two knots faster, and 10,000 tons larger than the most modern German liner, Kronprinzessin Cecilie. Passenger accommodation was 50% larger than any of her competitors providing for 552 saloon class, 460 cabin class and 1,186 in third class. Her crew comprised 69 on deck, 369 operating engines and boilers and 389 to attend to passengers. 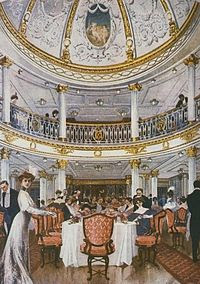 She had wireless telegraph, electric light, electrical lifts, and sumptuous interiors. The two ships both held the Blue Riband speed record for a transatlantic crossing at different times in their careers. Mauretania was generally the slightly faster of the two and continued to hold the record after the war until 1929. The Cunard board had decided to use Parsons' turbine propulsion, which accounted for their 22-year retention of the speed record with her running mate RMS Mauretania. The turbines produced more horsepower, and (theoretically) less onboard noise and vibration, compared to expansion engines used in earlier vessels. The ships were the largest ever built at the time they were constructed, and had 50% greater passenger space than their nearest rivals, allowing unprecedented luxury for all Saloon, Cabin, and Steerage passengers. Wikipedia tells that during the First World War, as Germany waged submarine warfare against Britain, the ship was identified and torpedoed by the German U-boat U-20 on 7 May 1915 and sank in 18 minutes. The vessel went down 11 miles (18 km) off the Old Head of Kinsale, Ireland, killing 1,198 of the 1,959 people aboard, leaving 761 survivors. The sinking turned public opinion in many countries against Germany, contributed to the American entry into World War I and became an iconic symbol in military recruiting campaigns of why the war was being fought. A dive team from Cork Sub Aqua Club, diving under license, discovered 15,000 rounds of the .303 (7.7×56mmR) caliber rifle ammunition transported on the Lusitania in boxes in the bow section of the ship. The find was photographed but left in situ under the terms of the license. In December 2008, Gregg Bemis's dive team estimated a further four million rounds of .303 ammunition were on the ship at the time of its sinking. Mr. Bemis announced plans to commission further dives in 2009 for a full-scale forensic examination of the wreck. Argument over whether the ship was a legitimate military target raged back and forth throughout the war as both sides made misleading claims about the ship. At the time she was sunk, she was carrying a large quantity of rifle ammunition and other supplies necessary for a war economy, as well as civilian passengers. Several attempts have been made over the years since the sinking to dive to the wreck seeking information about precisely how the ship sank, and argument continues to the current day. Jennifer Rosenberg wrote in her summary of the events somewhat apologetically that it was not the torpedo but rather the ammunition cargo on board that sank RMS Lusitania. In 2008, divers explored the wreck of the Lusitania, situated eight miles off the coast of Ireland. On board, the divers found approximately four million U.S.-made Remington .303 bullets. The discovery supports the German's long-held belief that the Lusitania was being used to transport war materials. The find also supports the theory that it was the explosion of munitions on board that caused the second explosion on the Lusitania. But why would you shoot a torpedo on a ship in the first place except in order to destroy it? RMS Lusitania was a passanger liner that sank in the North Atlantic Ocean off the coast of Ireland on 7 May 1915 after being hit by a torpedo sent by the ice cold heart of a human being. 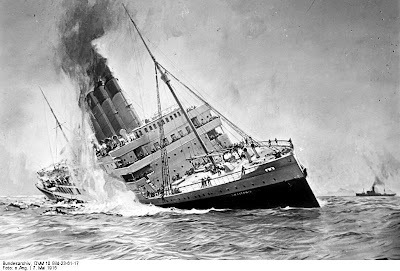 The sinking of Lusitania caused the deaths of 1,198 people in one of the cruellest wartime maritime attacks in history.